Texas toad; photo by Tom Spinker on Flickr (noncommercial use permitted with attribution / no derivative works). The Texas toad is found throughout most of the state (except the western Panhandle and the wetter portions of east Texas). The Texas toad can be found in a wide variety of habitats: grasslands, open woodlands, mesquite-savanna, and areas with sandy soil. The Texas toad has a round body covered with small warts. Coloring is gray with brown or yellow-green spots. Adult Texas toads reach just 2 to 3.5 inches in length. They are nocturnal and burrow in the loose soil. Diet consists of insects and other invertebrates. 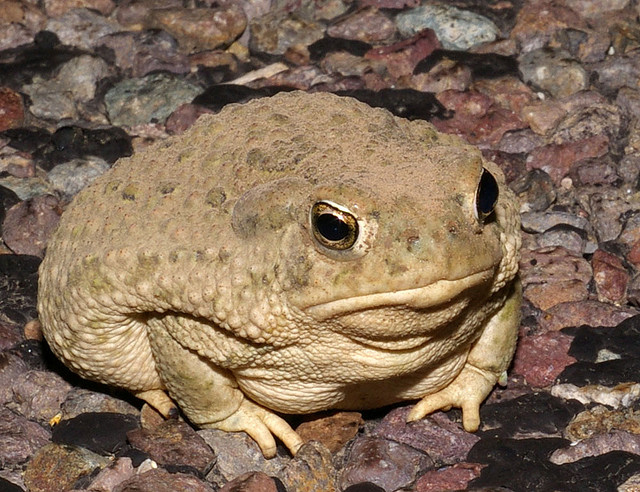 RESOLVED, That the 81st Legislature of the State of Texas hereby designate the Texas toad as the official State Amphibian of Texas.